After three days without games, the Thunder came out a little bit rusty against the Cavaliers. In the first quarter, after a slow start for both teams, Cleveland was able to create some space from Oklahoma City, and it closed the first twelve minutes with a seven points lead. The Thunder had to trail by eleven points, 33-22 in the early stages of the second quarter before they actually started to warm up on offense. The team lead by Russell Westbrook was able to close the first half with a tie score, 47-47. However, how often happened already this season, the Thunder took control of the game in the third quarter, and they started to build a solid lead of nine points thanks to their defense. In fact, the Cavs were able to score only fifteen points in the third quarter. 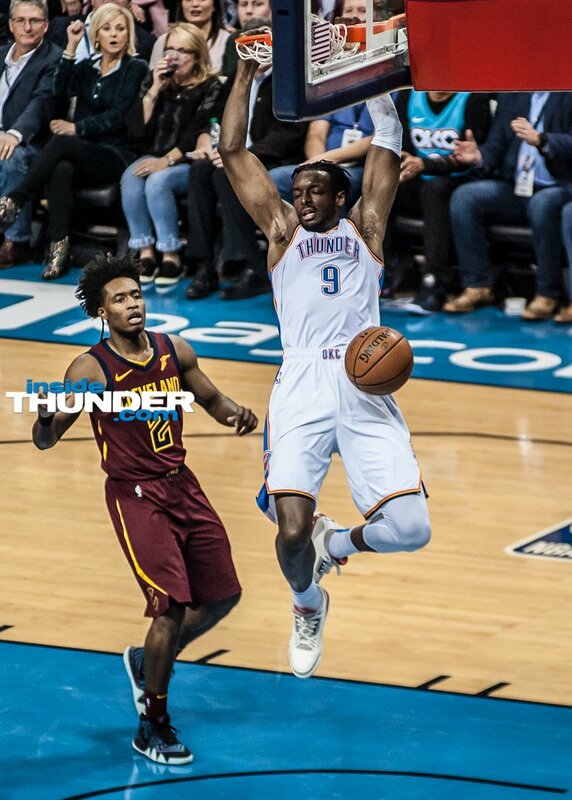 The excellent Thunder’s defense and the laking of offensive weapons for the Cavs made it easy for Oklahoma City to close out the game in the last quarter. The Thunder are now fourth in the Western Conference, 13-7. Definitely a better start than a year ago, when after twenty games Oklahoma City was 8-12. After probably his worst game of the season, Russell Westbrook bounced right back and had one of his impressive nights. He finished the game with twenty-three points, nineteen rebounds, fifteen assists, two steals, and only three turnovers. Westbrook’s also shot the ball particularly well: 10-17 FG, 2-5 3PT, 1-2 FT. His defense has been great during the whole game, fighting over screens, not gambling too much for steals, and he put pressure on the ball handler. On offense, he controlled the pace, moved the ball well, and took smart shots. Russell Westbrook, after last night’s triple-double, is now tied with Jason Kidd for the third spot in history for most triple doubles: 107. Jerami Grant is having his best season so far. Once again last night he provided everything the Thunder hoped for when they signed him this past summer: offense contribution and defensive anchor. Grant finished the game with twenty-one points (8-12 FG, 1-4 3PT, 4-5 FT), five rebounds, and four blocks. The full package. Jerami seems always in control on offense, he knows where to move without the ball, he runs the floor, and he is more balanced when he attacks the basket. On defense, not only he can stay on his man, but he can block shots and do strong closeouts. Last night the Thunder provided another outstanding defensive performance. Now, the Cavs aren’t the best offensive team in the league, they were rank 20th in offensive rating before entering the game against Oklahoma City, but the Thunder held them to 83 points. For today’s NBA standard, hold a team to 83 points, it’s close to perfection. After last night’s game, the Thunder are leading the NBA in defensive rating at 101.8 (the Celtics are second at 103.1). Also, Oklahoma City is leading the league in steals per game at 10.4. Two key players for the Thunder’s rotation are struggling to provide any sort of offense. Patrick Patterson and Alex Abrines. The Spanish wing didn’t have much luck with injuries/illness which kept him out of the floor for some games, so it might be understandable why he is struggling with his shooting, 1-8 from behind the arc last night. However, Abrines’ defense has been ok so far this season. We can’t say the same for Patterson. The veteran power forward is struggling on both ends of the floor. He has been scoreless for the past five consecutive games, 0-16 total from the floor, 0-12 from behind the arc. In the month of November, Patterson shot 26% from three and even worse from the floor, 25%. Thunder’s schedule has been quite easy so far. During the first twenty games, they played mostly against teams that are considered not very good, but what really matters, is that Oklahoma City is defeating the teams they are suppose to beat. This is a big difference compared to last season, where the Thunder struggled mostly against not playoff teams. In addition, Oklahoma City has been hit by injuries pretty badly in this first month and a half and being able to overcome also this factor, it shows how good the Thunder can be this year. The Oklahoma City Thunder will play once again at home, this time against the Atlanta Hawks. Tip-off 7 pm CT.